After entering a Stratego room, you will see a banner with a button "Open game field". At the right edge you can see two buttons named "Join". If you click on one of them you will join the game. The top one is for playing red, the other one for playing blue. After joining, the options can be set in the dialog in the middle. If one player is using an old client (or an old applet version), some options are not availible! Free arrangement: Players can play with a freely buildable start arrangement they like, enabling players to replay complex situations, e.g. for discussion or excercise. If that option is combined with Play open every player can set pieces of each color. 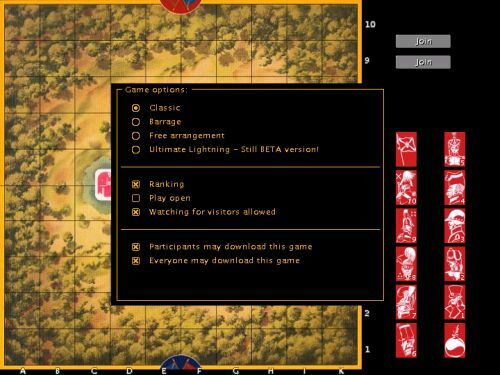 Ultimate Lightning: This is a special variation of the classic game, where each player has only 20 pieces with special abilities, please see section UL-Rules for more details. Ranking: If selected, the game will be added to the players rating. Important: This option can only be activated if both players are registered! Play open: Every piece will be visible from beginning on to any player and any visitor. E.g. to explain the game to newbies or for training. Watching for visitors allowed: If selected, all users in your room will be able to watch the game you're playing. Visitors will see all pieces hidden, but as the players they will see two fighting pieces openly and they can see the graveyard. If not selected, visitors will only see who is playing. Participants may download this game: If activated, both players will be able to download the game to replay it with StraDoS 2. 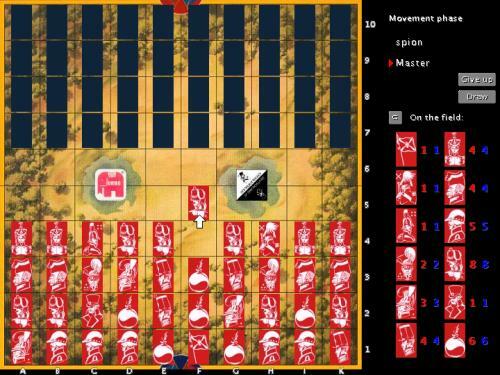 See Stratego game download page for more infos. Everyone may download this game: If activated, all registered users at Gravon may download the game. All games are anonymous (they don't contain informations about who played them) and are availible after a period of three days after being played. After the first player has set the options, he clicks on the OK button. Then the second player gets two buttons, "Accept" and "Reject". If he does not like the options, he can press "Reject" to reject the current options, otherwise he can press "Accept" and the game will start. After clicking the button the setup phase starts. At the right is shown how many of each piece is left to place. With the "reset" button you can empty the whole game field and start from the beginning. An already placed piece can be moved to another place by drag and drop or be removed again by dragging it to the outside of the game field. Click on a piece on the right side. If there are pieces of that sort are left to be placed, a white box will be shown around the piece. Then click on an empty field on the board and a piece of the selected sort will be placed there. After all pieces have been placed, a button "Done" will appear. Click it to confirm your setup. 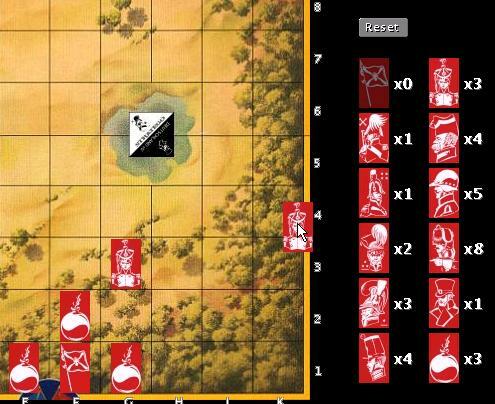 The white arrow is showing the last move. At the right edge you can see the graveyard. With the button you can switch between showing the number of pieces still on the field or showing the number of pieces already beaten. With the button you can resign and with the button you can offer your opponent a draw. At the right now is a button "OK". 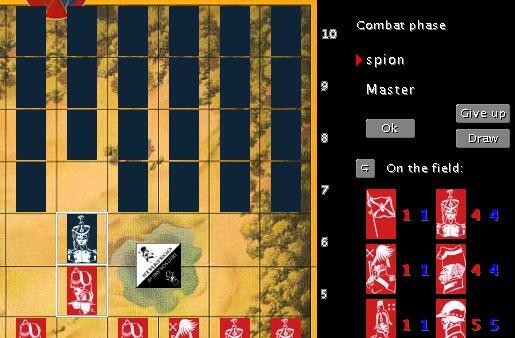 The fighting pieces are shown until both opponents have pressed the OK button. After that the piece of the opponent will be hidden again.